The Bucuresti Vest Combined Cycle Heat and Power Plant (CCHP) is located in the Romanian capital of Bucharest and supplies both electricity and heat to this city. Sited next to two existing 125 MW plants, it was built to meet Romania's rising demand for electric power. The owner of the plant is SC Electrocentrale Bucuresti SA (ELCEN), a major energy supplier in Romania that accounts for approximately 20% of the nation's power generation capacity. ELCEN's thermal power plants generate over 2 gigawatts (GW) of electricity, of which 1 GW is supplied directly to the city of Bucharest. The Bucuresti Vest CCHP consists of a GE 9E gas turbine that generates up to 135 MW, a heat recovery steam generator (HRSG) manufactured by Austrian Energy and Environment, and a SKODA steam turbine that generates up to 60 MW. The main contractor for this plant construction project was VA Tech Hydro's Combined Cycle Division. VA Tech Hydro's scope of supply included the complete electrical systems and instrumentation and control, all auxiliary plant units such as gas supply, and all structural engineering. 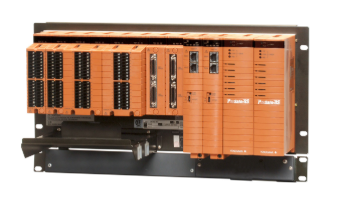 Yokogawa provided the CENTUM CS 3000/UOI distributed control system (DCS), ProSafe-RS Safety Instrumented System, and the Exaquantum Plant Information Management System, as well as engineering, installation, commissioning, and operator training services. The project was executed in a professional manner. The construction period was kept short – less than 30 months net – to facilitate a rapid return on investment. Yokogawa's state-of-the-art plant control system contributes significantly to high degree of plant automation and plant reliability. VA Tech Hydro GmbH & Co. is a global concern that belongs to the VA Technologie AG (VA Tech) group of companies. VA Tech Hydro is one of the world's largest suppliers of electromechanical equipment and services for the hydroelectric power generation market ("Water to Wire"), and holds a leading position in the growing power plant refurbishment sector. It has approximately 3,000 employees. In 2006, VA Tech Hydro's Combined Cycle Division was acquired by Siemens AG österreich, which is located in Vienna, Austria. The CENTUM CS 3000/UOI provides a single operator interface for the operation, management, and maintenance of the plant's turbines, HRSG, balance of plant (BOP) facilities, and electrical systems. 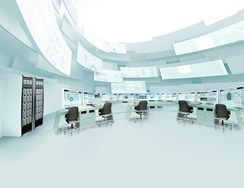 Yokogawa's unified operator interface (UOI) makes this possible. It was developed by Yokogawa to provide a common control platform for the CENTUM DCS and the GE Mark VI gas turbine control system. All data from the GE Mark VI turbine control system, Siemens Simatic steam turbine control system, and other plant systems can be accessed from the CENTUM CS 3000/UOI. No gateway is required. The Bucuresti Vest CCHP is operated and monitored from four operator stations that are located in the central control room and provide access to more than 90 process graphics. Each of these stations has four monitors that can display four separate graphics. In addition, there are four 50" operator displays. The turbine graphics and other system graphics are shown below. With these graphics at the CENTUM CS 3000/UOI stations, operators can monitor and control all the plant's different systems with the same look and feel. For the new CCHP, Yokogawa configured block sequences for automatic plant start-up and shutdown. The heating plant units that supply up to 190 MW of thermal energy to Bucharest's district heating network were also automated to ensure a high degree of flexibility in responding to fluctuations in demand. The power plant can be operated in an accentuated electrical mode or in an accentuated thermal mode that requires the calculation of complex mathematical equations. This computation can be handled by the DCS field control station (FCS) and does not need to be outsourced via OPC or other means. Alarm management at this power plant is done with Yokogawa's Consolidated Alarm List software. This manages both DCS and turbine controller alarms as well as alarms from subsidiary controllers and safety systems, using the sequence of events (SOE) signals to timestamp these events with millisecond accuracy. VA Tech Hydro chose Yokogawa's automation system for this project because of the demonstrated capabilities of the CENTUM CS 3000 control system in power plant applications and its compliance with the relevant VGB guidelines. An additional factor leading to this decision was this system's use of redundant Profibus cards in keeping with the Profibus decentralized periphery (DP) concept and its support of IEC60870 communication profiles. The design and structure of the CENTUM CS 3000 DCS for this new power plant met this customer's high expectations in terms of availability and operational reliability. It's easy to navigate through the power plant control and turbine control processes as both are represented in a similar manner and run on the same visualization platform. The process graphics that were prepared for this project are excellent overall, with well structured and detailed process overview and operator displays. The Consolidated Alarm List software helps operators quickly identify cause and effect relationships in power plant and turbine control.